Reach Subsea visited our stand during Oceanology 2018. 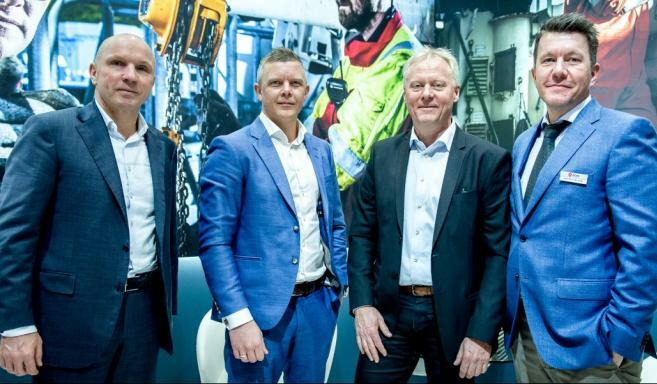 From left to right: Marcel Burghouwt (Atlas), Knut Jacob Medhaug and Sven Magne Storesund (Reach Subsea) and Jean Paul de Jong (Atlas). Established in 2008 by four subsea specialists, Reach Subsea has grown steadily over the last decade and now has a fleet of seven survey and construction vessels and 12 Remotely Operated Underwater Vehicles. Around 18 months ago, the Norwegian company needed Australian ROV pilots for the McDermott Ichthys LNG Project and it turned to Atlas Professionals, which has a branch in Perth. Knut Jacob Medhaug, ROV Manager Reach Subsea, outlines the company’s strategy and also why it has decided to work with Atlas. Initially, he explains, the company was a consultancy for the offshore oil and gas business but in 2012 it adopted a new growth strategy. It was listed on the Oslo Stock Exchange to raise the necessary finances and then it set about purchasing assets and hiring personnel. “In 2012 it was a good market. We eventually managed to get a vessel off the west coast of Africa and then this headed to our first job in the Orkney Islands. We had one survey vessel, two ROVs and a handful of employees. “Our mission was to be the preferred vendor of subsea services in the world and that is still the case.” This doesn’t necessarily mean the biggest, he stresses, but the best. Knut Jacob believes that Reach Subsea has the competitive edge because it is still a ‘very lean organisation’. “Our offshore team is a group of specialised people. We give a lot of responsibility to our offshore workers, they can make decisions and we are there to support them.” Additionally, we have a strong engineering department in order to meticulously plan operations offshore, he adds. Based in Haugesund, Reach Subsea has a diverse fleet of seven survey and construction vessels, the largest of which is the 150- m long Viking Neptun, which is equipped with a 400-tonne crane. The company has 12 ‘Work Class’ ROVs and two are dedicated, fast-swimming survey vehicles. “These two are a game-changer in the surveying industry,” he stresses. The two fast swimmers are capable of 7 knots compared to a typical ROV that travels at 2/3 knots. In June the new, second fast-swimming ROV was being prepared for operations and the first is deployed in the Baltic Sea on the Nord Stream offshore natural gas pipeline. As well as the growth in its fleet, Reach Subsea has seen a large increase in its offshore personnel. Numbers have grown from 16 ROV pilots in 2013 to 110 in 2018, including the Atlas consultants. Initially the company started working with Atlas because of the McDermott Ichthys LNG Project, he explains. “Australia has strict local content requirements. It is quite challenging to find experienced ROV pilots generally, but Australia has its own ROV systems so the pilots were also not used to working with our Kystdesign systems. “We flew to Atlas in Perth to discuss the Australian rules and regulations and additionally, we never hire people as consultants without interviewing them first. Overall, Knut Jacob says that the company is seeing activity levels increase in 2018 over 2017. “The market is brighter but this is not really reflected in the rates unfortunately. There is a lot of potential in wind power projects in the US and Northern Europe and there are some prospects coming up in the oil and gas sector too, he says.